Now in its 3rd year, the Umbrella Golf Classic in Canada has become a great annual fundraising event for the children of Umbrella. 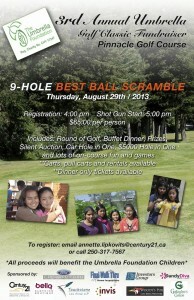 This ’9-hole best ball scramble’ is organised by Annette Lipkovits, a previous volunteer, current fundraiser and annual visitor! The ticket price includes a round of golf, buffet dinner, prizes, silent auction, Car Hole in One, $5000 Hole in One and plenty of on-course fun and games! Please go along and support the event, it’s sure to be a great day out! * Dinner only tickets also available.